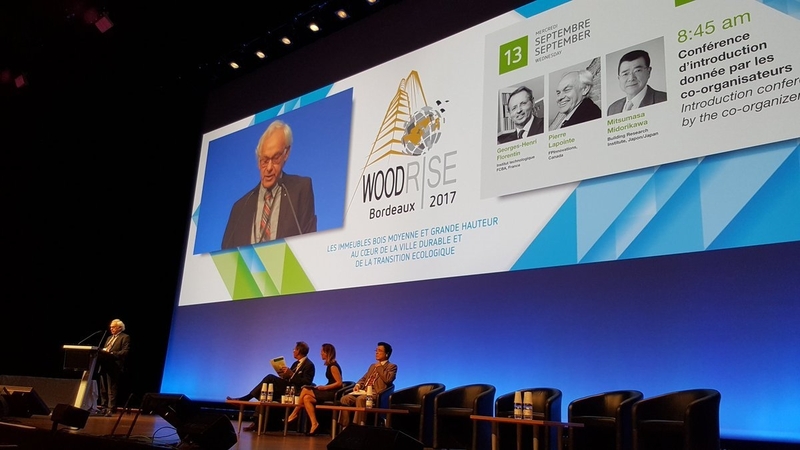 Sept. 14, 2017 - WOODRISE, the world's first conference dedicated to mid-rise and tall wood buildings opens its doors in Bordeaux, France. Organised by the Institut technologique FCBA, France, FPInnovations, Canada, and the Building Research Institute, Japan, with the participation of ADIVbois, France, WOODRISE will unite, for the first time, over 1500 international stakeholders from the wood, construction and urban planning professions around the subject of wood as a material essential to the development of sustainable cities. The event was inaugurated Tuesday evening by Alain Rousset, President of the Région Nouvelle Aquitaine, Georges-Henri Florentin, of the Institut technologique FCBA, and Line Beauchamp, Delegate General and personal representative of the Quebec Premier for the Francophonie. The conference officially started today with presentations by Georges-Henri Florentin of the Institut technologique FCBA, France, Pierre Lapointe of FPInnovations, Canada, and Mitsumasa Midorikawa of the Building Research Institute in Japan. Other notable speakers over the course of the four-day event include the Honourable Stéphane Dion, Canadian Ambassador to Germany and Special Envoy to the European Union and Europe, Alain Juppé, Mayor of the city of Bordeaux, Robert Jones of Natural Resources Canada, and Michael Green of Michael Green Architecture, Canada. An emerging trend in many cities around the world, such as Bordeaux, mid-rise and tall wood buildings contribute to a rethinking local planning while considering the associated environmental challenges. Identify economic development opportunities and how to implement them with regard to these new markets of the wood sector. Value competencies and national resources in a circular economy.